And although I may consider this work unworthy of your countenance, nevertheless I trust much to your benignity that it may be acceptable, seeing that it is not possible for me to make a better gift than to offer you the opportunity of understanding in the shortest time all that I have learned in so many years, and with so many troubles and dangers; which work I have not embellished with swelling or magnificent words, nor stuffed with rounded periods, nor with any extrinsic allurements or adornments whatever, with which so many are accustomed to embellish their works; for I have wished either that no honor should be given it, or else that the truth of the matter and the weightiness of the theme shall make it acceptable. 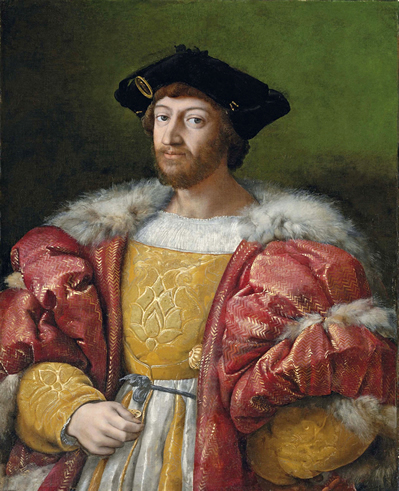 Medici dynasty, Cosimo De’ Medici. Machiavelli’s life and career are inseparably intertwined with the Medici family. In Machiavelli’s day (1469 – 1527), the Italian peninsula was made up of many independent city-states, a territory comprising a dominant city and its surrounding towns and country side. Of these, there were 5 principal centers of power: Florence (Niccolò’s home town), Naples, Venice, the Papal States, and the Kingdom of Naples. Most city-states were ruled by a prince. Florence and Venice were exceptions in that they were, in name at least, republics. In practice, the government of both states was dominated by a commercial oligarchy. In Florence, the ruling oligarchy was controlled by the Medici family. The family’s political career began in 1434 when Cosimo de’ Medici (already a fabulously wealthy banker) overthrew the previous ruling family, the Albizzi. Cosimo was a shrewd and far sighted ruler who not only founded an enduring political dynasty but enhanced his reputation by becoming a patron of the city’s architects and artists and thereby helped to make Florence the epicenter of the Renaissance. Cosimo’s method of control was subtle. He preserved the republican institutions, but controlled them by means of his prestige, supplemented by patronage and vote rigging. His successors would tighten Medici control in the city. In Chapter 9 of The Prince, Machiavelli would describe the Florentine government as a civil principality. Cosimo was succeeded in 1464 by his short lived son, Piero the Gouty (1416 1469). Prominent oligarchs challenged Piero’s leadership, but he crushed the insurgents and further consolidated the family’s grip on the levers of power. As a result, on Piero’s death in 1469 (the year of Niccolò’s birth), Piero’s his 20 year old son, Lorenzo (known to history as Lorenzo the Magnificent) succeeded him without resistance. Lorenzo presided over the last period of peace and prosperity in Florence before the deluge of foreign invasion that followed soon on his death. It was this Florence (which historians would call the Golden Age) that shaped Machiavelli’s early life. Some of the critical events of that period probably influenced The Prince. For example, in a typically Renaissance incident, a rival faction (the Pazzi) staged an elaborate conspiracy to assassinate Lorenzo and his brother in church on Easter Sunday. The brother died, but Lorenzo lived and emerged richer and politically stronger as a result of the purge for which the assassination attempt provided a pretext. Although the Pazzi conspiracy happened when Machiavelli was only 9, it must have been much discussed in Florence and it is probably no coincidence that the longest chapter in The Prince deals with conspiracies. Lorenzo died at the dawn of the age of discovery, in 1492. His son, Piero the Fatuous, succeeded to Lorenzo’s position, but not to his talent. Piero was a young man of 23 when, in 1494, the King of France, Charles VIII, set Italian politics on a new course by invading Italy to assert his claim to the Kingdom of Naples. The incursion was to prove to be the first of several devastating invasions in which powerful outside forces would ravage Italy. Piero handled the crisis so badly that the elite drove the Medici family from power. His downfall also ended the Medici Bank on which the power of the family was built. For the remainder of Machiavelli’s life foreign powers would occupy Italy and devastate it with their battles for dominance. The foreign occupation lends a sense of crisis that colors Machiavelli’s writing thought The Prince. The expulsion of the Medici brought to power a new government which was a more inclusive republic led by Piero Soderini. It was in this administration that Machiavelli’s career flourished. In 1498, he became, Secretary to the Second Chancery of the Republic of Florence. However, the eclipse of the Medici and Niccolò’s career proved to be short lived. The Medici returned to power in 1512. What enabled the family’s revival was the strategic thinking of Lorenzo the Magnificent, who had steered the family out of banking and into the Church. Lorenzo used his political and financial influence to procure positions in the church for his son Giovanni (Pope Leo X), and for Giulio, the illegitimate son of his brother, Giuliano (Pope Clement VII). Neither Leo nor Clement was a distinguished Pope. Leo failed to take seriously the threat posed by Luther, who posted his 95 Theses in 1517. In fairness to Leo, suppressing Luther and the reformation was made nearly impossible by the innovation of printing, which Gutenberg launched with the publication of his famous Bible in 1454. Worse still, Clement was pope in 1527 (the year of Machiavelli’s death) when the troops of Holy Roman Emperor, Charles V, sacked Rome. Even though they were no match for the powerful forces at work in Europe as a whole, the Medici popes influence proved decisive in the politics of Florence. At this time, the Papacy was not only a church, but also a principality, a political power. It held lands from Rome, in west central Italy, to Ravenna, in the north east. Thus when Giovanni became Pope Leo X, he was able in 1513 to make Lorenzo the Magnificent’s third son, Giuliano (1478-1516) a puppet ruler of Florence. Machiavelli originally dedicated The Prince to Giuliano, but he died suddenly that same year. 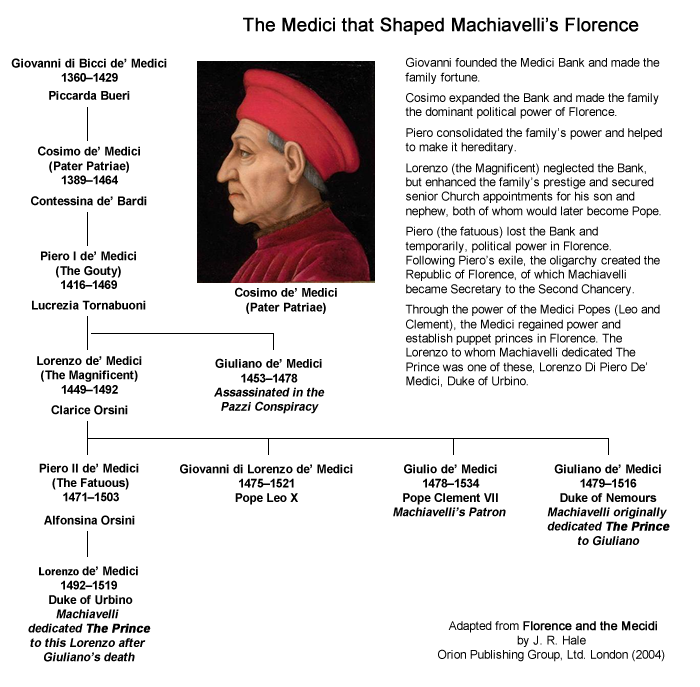 Later in 1513, Pope Leo X turned to Lorenzo the Magnificent’s grandson and the son of Piero the Fatuous, Lorenzo Di Piero De’ Medici, and made him his puppet ruler in Florence and in (1516) made him the Duke of Urbino. It was to this Lorenzo that Machiavelli dedicated The Prince. Thus, the “Magnificent” Lorenzo to whom Machiavelli dedicated The Prince is not the genuine Lorenzo the Magnificent, but Lorenzo di Piero de’ Medici, the son of Piero the Fatuous) and therefore the grandson of the famous Lorenzo. Machiavelli’s dedication strikes us as sycophantic flattery, but it makes more sense in context. Printing was a new business. There was, as yet, no publishing industry that would enable an author to live from his royalties. In lieu of royalties, it was conventional for an author to dedicate a book to a powerful person in the expectation of gaining some reward, or sinecure as remuneration. If Machiavelli’s intent was simply flattery, he missed his mark, because in The Prince, Machiavelli bluntly tells Lorenzo that he is faced with a formidable task. The book begins by expounding the thesis that of all the ways to come to power the most difficult and dangerous way, is precisely the way that Lorenzo rose to power, quickly, by good fortune, and by the power of a patron. For this reason, we may suspect that Machiavelli’s motivations in writing The Prince were much more complex than simple flattery. At one level, Machiavelli was sincerely relating his analysis and assessment of the political situation that Lorenzo would have to face. Niccolò packages the message as best he can by saying that there is a recent example (Cesare Borgia) who very nearly succeeded. Near the end of the book, in Chapter 23, Machiavelli goes out of his way tell to Lorenzo that flatterers who do not tell a prince the truth are very dangerous. By extension, those (like himself) who tell him the blunt truth are true friends. In the penultimate chapter (25) Machiavelli says that there is reason to hope that prudence can overcome Italy’s current ill fortune, and in the final chapter (26), he offers additional reasons why Lorenzo might hope to succeed. All that is not to say that in writing this short book Machiavelli did not have other, more long-term agendas, and I will note some of these in the comments. The Prince, like The Bible may have various deep messages, but whatever they may be, they are enunciated in the context of a very specific time and place. Just as it is impossible to understand The Bible without an understanding of the history of the ancient Middle East, we cannot hope to understand The Prince without an understanding of Renaissance Europe, Italy, Florence, and the Medici. The first 4 of the 6 chapters of Florence and the Medici give a lucid and brief account of the family that built and dominated the Florence that Machiavelli and his readers knew.